An esteemed artist of distinction, the American pianist DIANE WALSH is regularly heard on disc and in recital, chamber music and concerto performances throughout the world. In addition to possessing a vast and varied repertoire, ranging from Bach to Bolcom, her recent work on the theatre stage has brought wider recognition of her superlative musical gifts. Diane Walsh has been guest soloist with the American Symphony Orchestra and the orchestras of Austin, Delaware, Indianapolis, San Francisco, St. Louis and Syracuse, and toured with the Orpheus Chamber Orchestra and the Orchestra of St. Luke’s. Abroad, she appeared with the radio symphony orchestras of Berlin, Frankfurt, Munich and Stuttgart, as well as orchestras in Brazil, The Netherlands, The Czech Republic and Russia. Among the noted conductors with whom she has collaborated are Kazuyoshi Akiyama, David Amado, Guillermo Figueroa, Peter Bay, Leon Botstein, Michael Butterman, Grant Cooper, John Giordano, Stephen Gunzenhauser, Eliahu Inbal, Keith Lockhart, John Nelson, Roger Nierenberg, Kyle Wiley Pickett, Ranson Wilson and David Zinman. In recital, Ms. Walsh has been presented in many of the country’s most distinguished venues, among them New York City’s 92nd Street Y, Merkin Concert Hall, The Metropolitan Museum of Art and Miller Theatre, The John F. Kennedy Center for the Performing Arts in Washington, DC and Chicago’s Orchestra Hall, while international sites include Wigmore Hall (London), the Concertgebouw (Amsterdam), Philharmonic Hall (St. Petersburg), Dvorák Hall (Prague) and the Mozarteum (Salzburg). Diane Walsh joined the cast of 33 Variations, the award-winning play by Moisés Kaufman, in its 2007 debut production at Arena Stage in Washington, DC. The work is focused on Beethoven’s last years and his composition of the Diabelli Variations, which Ms. Walsh performed on stage throughout the play. After a subsequent run at the La Jolla Playhouse, 33 Variations opened on Broadway at the Eugene O’Neill Theatre, starring Jane Fonda and with Ms. Walsh as the pianist. From February through May 2009, she appeared in 113 performances. Ms. Walsh returned to 33 Variations, again starring Ms. Fonda, for a five-week run at Los Angeles’ Ahmanson Theatre in February, 2011. An active recording artist, Diane Walsh has released 18 discs of diverse repertoire for Biddulph, Composers Recordings, Inc., KOCH International, Newport Classic, Nonesuch, Sony and Stereophile. Jonathan Digital Recordings has issued Beethoven’s Diabelli Variations and, two volumes of the complete Schubert Piano Sonatas. In the spring of 2015, she released an album of Bach suites on a private label, available from CDBaby.com, while digital downloads are available from Amazon and iTunes. Diane Walsh is constantly in demand as a chamber musician, frequently performing at the music festivals of Bard, Cape Cod, Chesapeake, Marlboro, Portland, Santa Fe, Strings Music Festival and the International Musician’s Seminar in Cornwall. She has collaborated with the Brentano, Fine Arts, Jupiter, Lydian, Mendelssohn and New Zealand string quartets, and is a member of both the Walsh-Drucker-Cooper Trio and La Fenice (comprised of piano, string trio and oboe). From 1999 to 2004, Ms. Walsh served as Artistic Director of the Skaneateles Festival in upstate New York, a tenure during which she presented world-renowned performers and designed and performed in innovative programs that included An Evening with Bill Irwin and The Love Letters of Robert and Clara, set to music by the Schumanns. 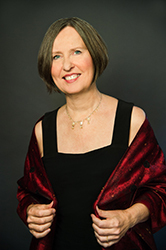 Among her many honors and awards, Diane Walsh includes the Concert Artists Guild International Competition and the Young Concert Artists International Auditions. She was winner of top prizes in the Munich ARD and Salzburg Mozart competitions, as well as Maryland’s William Kapell International Competition and Italy’s Busoni International Competition. A prizewinner in the Van Cliburn International Piano Competition, she also won that competition’s chamber music award. Diane Walsh was associate professor at New York City’s Mannes College of Music for 32 years and, in the Fall of 2015, served as Visiting Artist at Colby College in Maine. She lives in Portland, Maine with her husband, the writer Richard Pollak. Ms. Walsh is a Steinway Artist. Walsh is a performer of great honesty and integrity, a pianist with superb technique that never gets abused for vainglorious displays and which is consistently and effectively applied to the service of great and lesser music alike, [Beethoven’s] Sonata in E Major, Op. 109, one of the sublime masterpieces in all of music, got a performance worthy of its status - lyrical, contemplative, powerful and moving. With plenty of Romantic sweep and arching lyricism, unflagging stamina and bravura, Ms. Walsh dispatches the Bartok Sonata with vigor and authority. Clara Schumann’s Concerto for Piano and Orchestra in A Minor, under the accomplished fingers of Diane Walsh, was in many ways reminiscent of Chopin in its minimal orchestration, Romanticism, use of the Polonaise dance form, and virtuoso flourishes, some borrowed from Liszt. Her interpretation of the concerto revealed why Clara Schumann was queen in the arena of virtuosi. It is a showpiece and it wowed the audience at Merrill as it must have those in European capitols. The listeners gave it a standing ovation with cheers. Between the Brahms and the Schumann, Diane Walsh joined the orchestra as soloist in Clara Schumann’s Piano Concerto in A minor. It’s a surprisingly mature work, given that she completed it at age 14, and it includes some fascinating innovations–most notably, a central movement for piano and cello alone. It is a lively, sometimes playful work, with a sparkling piano part that offers a glimpse of the technique for which Clara was renowned. Walsh gave it a thoughtful performance, with enough energy to bring its considerable melodic riches and surprising harmonic turns fully to life. And Walsh and cellist William Rounds gave a beautiful account of the duet movement. The second selection was a piano concerto by the 15-year-old Clara Schumann. The soloist was Portland resident Diane Walsh who played with surefire control of dynamics and technical command. The best part of the performance occurred during the 2nd movement when the orchestra stopped playing and a beautiful duet ensured with a solo cello ravishingly played by [Williams Rounds] and Ms. Walsh doing the honors. Her sound, gestures and coloration suggested that she thinks of the Partita [#4 in D, BWV 828] in orchestral terms, and the most winning aspect of her performance was that she was able to create the illusion of orchestral heft while sacrificing nothing of the transparency that Bach’s counterpoint demands. After the high-flying Bach, it [Bolcom’s Graceful Ghost Rag] was the perfect way to bring listeners down to earth. Ms. Walsh has already almost all of the attributes of greatness. The power and animation in her playing made a great impression. I particularly admired the range and beauty of her tone. Her performances merged a profound comprehension of musical purposes with rare lyric fervor. And to each work, she brought not only a lovely tone and immaculate technique, but a deep sense of personal conviction. In the Mozart G Major Concerto, K. 453, there were technical acrobatics, pearly fluency, rich variety of touch, cantabile in the quick movements as in the slow middle movement and playful lightness. This is the first volume of Schubert’s complete piano sonatasan impressive challenge for any pianist to undertake. I was won over by the beauty of the playing and the untroubled interpretive smoothness. Walsh spins out the line with great attention to nuance and color, serenely moving, always song-like, and expressive. This disc inaugurates an integral (5-CD) cycle of the Schubert piano sonatas, and judging from this first volume, it promises to be an outstanding one. Diane Walsh would seem to be the perfect pianist for this music; she follows the score with the utmost fidelity, and her technical command, beautiful sound, and sensitive phrasing contribute to insightful performances. Diane Walsh presented Chopin [Concerto #2] as more of a Classicist than a Romantic, partly by pedaling lightly, and partly by playing the solo line with as a clarity that focused on its rationality rather than on its perfume. Walsh’s reading also had a buoyant, singing quality. For listeners who craved more Romantic virtuosity, Walsh gave a dazzling performance of the Liszt-Paganini La Campanella as an encore.